I'm always happy to take up a challenge, in fact some of my best ideas come from them. So when I was challenged to come up with a family meal cooked in the shortest possible time to save energy. I got my thinking hat on. I could tell you I thought long and hard, but that would be a lie. As soon as I saw the mushrooms, avocados and goats cheese, I knew exactly what I wanted to make. See what I mean? They are wonderful, simple and inspiring. I stuffed these mushrooms with wilted spinach, chopped cashew nuts, sliced avocado and goats cheese and baked them. They were fabulous. Succulent, and creamy, with a crunch from the nuts. Mmmmmmm! 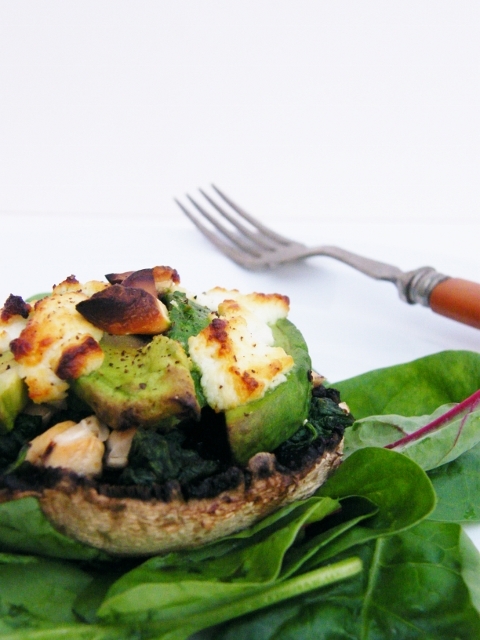 Succulent mushrooms, seasoned with black pepper and baked with a filling of wilted spinach, avocado and goats cheese with a crunch from roughly chopped cashew nuts. 1. Preheat the oven to 230c / 210c fan / 450f / gas mark 8. 2. Peel the mushrooms, season with black pepper and set aside.2. Wilt the spinach. Rinse it in a colander, then pour a kettleful of boiling water over it to wilt it. Finish with cold water to cool it, then squeeze as much water out as possible, then chop and spread over the mushrooms.4. Sprinkle some nuts over each mushroom, then top with slices of avocado and some goats cheese. 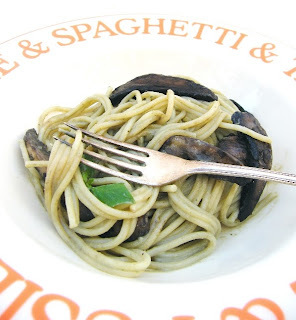 Season with pepper and bake for 15 minutes until the mushroom is cooked.5. Serve with a green salad or vegetables.6. Enjoy! Oh my this looks delicious, I have never thought about stuffing mushrooms goat cheese. It is so very good Mary, you must try it. Wow - this looks so tasty. Not a fan of goats cheese so I think I'd try halloumi or mozzarella but otherwise, wishing I had the ingredients to make this now. I love mushrooms and they haven't featured in anything recently. I seem to have forgotten about them! Yes, do try it with those or perhaps feta? That looks lovely - and quick and easy! I was going to say that's the best part, but actually the flavour is. Me too Tandy, me too! As I've just tweeted I tried my own variation of this for tea tonight. I decided on blue Stilton rather than the goat's cheese and used my halogen oven to cook it. It turned out very nice but I needed to turn the oven down a couple of times and ended cooking short of the recommended 15 minutes. Well, I ended it before the timer ran down but I suspect that was because the timer got stuck. Next time I'll try my gas oven even though that only goes up to around 180C. Always keep an eye on things in the oven Mike. Ovens can be so different and it also depends on which shelf you use. Adding stilton was a great idea! 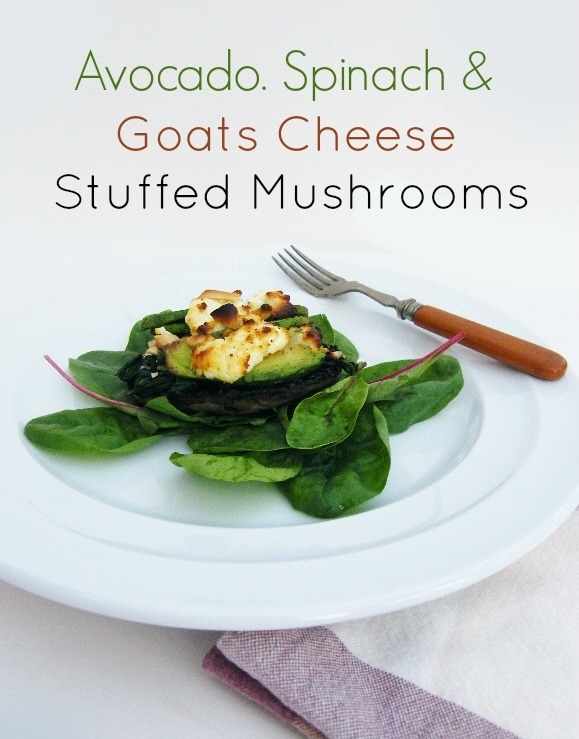 Love mushrooms, and so creative to stuff them with avocado and goat cheese. Great flavor combination! Such simple ingredients to make such a tasty dish. I can use soem feta instead as that is a big pantry staple of mine.